Small Town Monsters and artist, Steve Bissette are thrilled to present the official poster for the new miniseries directed by Aleksandar Petakov and produced by Seth Breedlove, ON THE TRAIL OF...CHAMP. The miniseries chronicles North America’s most infamous lake monster, affectionately known as “Champ”. Centuries of lore, sightings and mystery surround this creature as well as the lake it calls home. Shot on location at Lake Champlain, Vermont/New York, USA, ON THE TRAIL OF... CHAMP dives deep into the rich history of the region in connection with Champ, as well as Champ’s cultural impact in many of the rural communities that border the lake. Various eyewitnesses of the creature recall their encounters, including Sandra Mansi, who in 1977 took a photo of the creature considered by some to be the best evidence for any lake monster. Katy Elizabeth of Champ Search, as well as Scott Mardis & William Dranginis, comprise of research teams using different methods and state of the art technology to document and prove the existence of monsters in Lake Champlain. Their hunt for the creature takes them from the deep waters of the lake to its winding rivers and primeval swamps and marshlands. 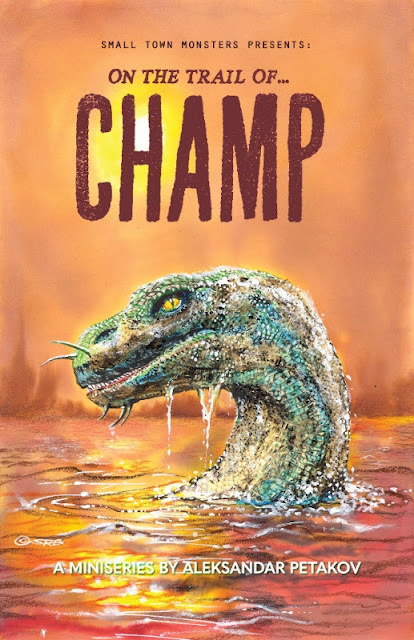 While definitive proof of Champ is yet to be claimed, the monster has certainly succeeded in captivating the hearts and minds of many people, whether witnesses, researchers or fascinated locals. These are their stories…on the trail of Champ. On 16th June 2018 the series will debut online at Vidi.space and on DVD, followed a month later by Amazon and Vimeo OnDemand. To accompany the unveiling of the poster they have launched pre-orders for the DVD over at the Small Town Monsters storefront which you can find by clicking HERE. Pre-Order your DVD copy of ON THE TRAIL OF...CHAMP today to guarantee delivery by the series' release date!